The IPMH group had a wonderful weekend with Lynne Murray. Lynne talked about the effects of postnatal depression in the mother on the developing child, and the effects of maternal anxiety on the developing child. I will discuss postpartum depression in this blog and anxiety in a subsequent posting. Depression can be defined as a pervasive low mood, loss of interest, and feelings of guilt or even the wish to die, and usually includes neuro-biological features such as sleep or appetite disturbance, loss of concentration, retardation or agitation, and excessive fatigue. The point prevalence of depression in childbearing years (the proportion of women in child-bearing years that has depression at a specific point in time) is more than 8%. 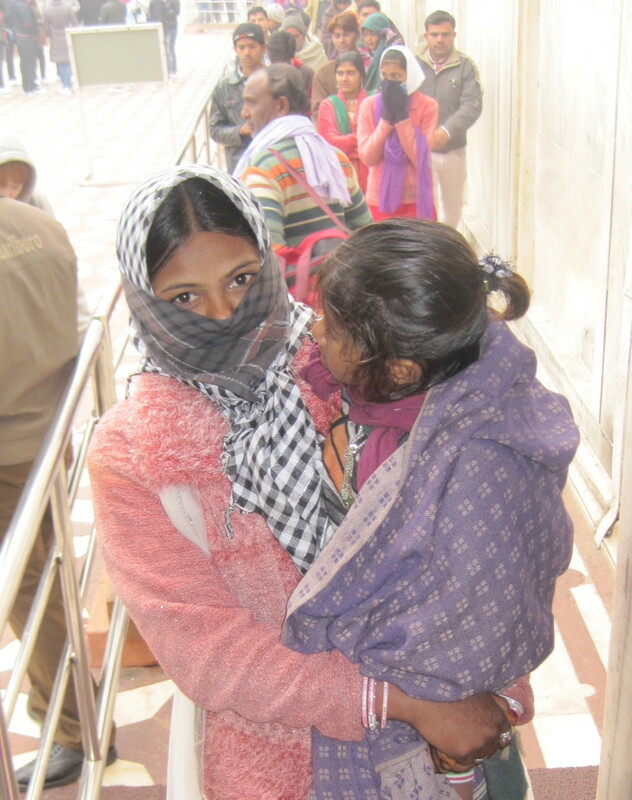 The prevalence of women with depression 3 months postpartum ranges from 13% in high-income countries (Gavin et al, 2005, Pearlstein et al, 2009) to 20% in low-income countries (Fisher, 2012, Pearlstein et al, 2009). Most women with postpartum depression recover within 6 months, but a significant proportion (30%) continue to be depressed after one year (Goodman et al, 2004). The impact of a mother’s postpartum depression on her developing infant derives from the fact that this condition occurs at a time of an infant’s maximum dependency on his mother (I will refer to the infant using the masculine pronoun to distinguish the infant from pronouns indicating the mother.) and at a time when the infant is most sensitive to his mother’s cues and will be most strongly influenced by them. Nature has encouraged the process of mutual communication between babies and adults by giving baby faces features that adults find irresistible and by making babies prefer human faces to other visual images. In fact, an adult has specific brain responses to gazing at a baby (especially a mother to her own baby) that are similar to those when gazing at her romantic partner. There is also a rise in the “love hormone”, oxytocin. Gazing at a baby sets off specific behaviors such as a stereotyped greeting (raised eyebrows, open mouth, smile) and changes in the voice (high pitch, simple phrases, melodic pitch). Correspondingly, the infant will gaze longer at an image with the configuration of a human face (schematic eyes, nose, mouth) than at a blank face shape or one with scrambled internal features. Newborns also prefer faces with eyes open and with a gaze directed at them than eyes closed or averted gaze (A Batki et al, 2000, Farroni et al, 2002). The famous studies of Meltzoff and Moore showing that newborns can imitate an adult sticking out his tongue or opening his mouth wide demonstrate the amazing capacity the infant has for “cross-modal” responsibility. In other words, the infant can perceive the visual image of the adult making these movements and respond by making a facial action that mirrors that of the adult through an “active intermodal mapping” ( Meltzoff & Moore, 1989, p. 961). You can imagine that this ability in the newborn prepares the infant to be able to connect with the adult caregiver in a remarkable way. Not only that, but newborns also prefer their mother’s face, voice, and smell, rather than someone else’s. All these preferences prepare the infant to make a connection to his particular caregiver. However, postpartum can intrude into the caregiving relationship just at this sensitive time when the infant is ready for a special connection and needs it for his healthy development. Colwyn Trevarthen calls the back and forth gaze, gestural, and vocal exchange of the caregiver and infant in the first few months as “proto-conversation” (Trevarthen, 1978). 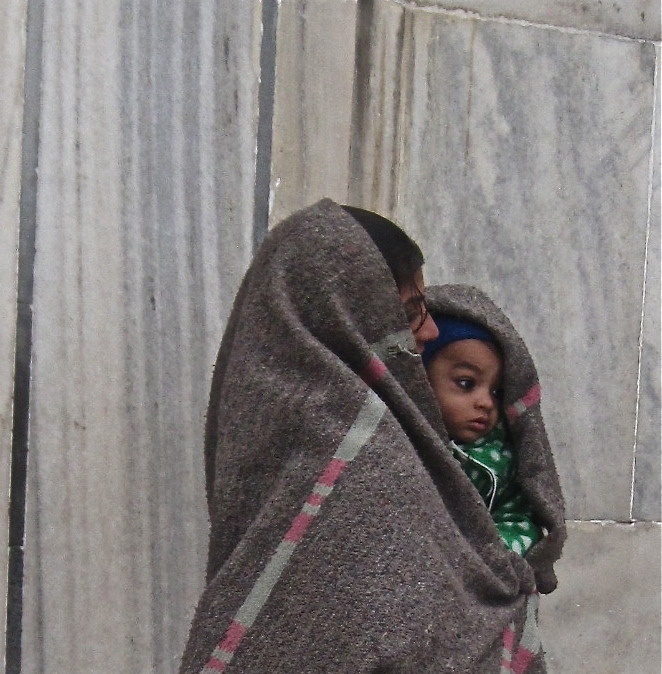 This important communication between mother and infant can be interfered with when the mother is depressed. Mothers with postnatal depression tend to show general insensitivity to their infants’ cues with two main patterns of response – either remote and disengaged or hostile and intrusive. In both cases the infants are likely to avoid contact with their mothers and become distressed. In low risk samples, the PND mothers are less sensitive but the disturbance is subtler, with problems occurring more often with boy babies than with girls. In fact, after the mother’s recovery from depression, there tend to be persistent difficulties in the interaction between mother and infant (Martins & Gaffan, 2000, Murray et al, 1996). It is important to recognize that different parenting practices are associated with different patterns of child development; weaknesses in one area do not always predict weaknesses in another. Murray has documented different parenting practices associated with cognitive development and achievements (IQ), behavioral regulation problems in childhood, and depressive disorder in adolescence. I will discuss these three areas of child development and the effects of PND in several subsequent blog postings. I will emphasize the potential for mothers with PND to modify their behavior towards their infants in order to possibly mediate these effects. Batki A, Baron-Cohen S, Wheelwright S, Connellan J, Ahluwalia J (2000). Is there an innate gaze module? Evidence from human neonates, Infant Behavior & Development, 23:223-229. Farroni T, Csibra G, Simion F, Johnson M, Eye contact detection in humans from birth, Proceedings of the National Academy of Sciences, 99:9602-9605. Fisher J, Mello M, Patel V, Rahman A, Tran T, Holton S, Holmes W (2012). Prevalence and determinants of common perinatal mental disorders in women in low-and lower-middle-income countries: A systematic review. Bulletin of the World Health Organization, 90:139-149. Gavin N, Gaynes B, Lohr K, Meltzer-Brody S, Gartlehner G, Swinson T (2005). Perinatal depression: A systematic review of prevalence and incidence, Obstetrics & Gynecology, 106:1071-1083. Goodman J (2004). Postpartum depression beyond the early postpartum period, Journal of Obstetric, Gynecologic & Neonatal Nursing, 33:410-420. Martins C, Gaffan EA (2000). Effects of early maternal depression on patterns of infant-mother attachment: a meta-analytic investigation, J Child Psychol Psychiatry 41(6):737-746. Murray L, Fiori-Cowley A, Hooper R, Cooper C (1996). The impact of postnatal depression and associated adversity on early mother-infant interactions and later infant outcome, Child Development 67(5):2512-2526. Pearlstein T, Howard M, Salisbury A, Zlotnik C (2009). Postpartum depression, American Journal of Obstetrics & Gynecology, 4:357-364. Trevarthen C & Hubley P (1978). Secondary intersubjectivity: confidence, confiding and acts of meaning in the first year. In A. Lock (Ed.) Action, gesture and symbol: The emergence of language, London: Academic Press (pp. 183-229). This entry was posted in Articles on March 15, 2015 by Alexandra Harrison. Peter Fonagy and his colleagues have introduced and elaborated the concept of metallization. Metallization includes the developmental capacity to reflect on one’s inner life and to imagine the inner life of another person. It is central to important other capacities such as the capacity of empathy and self control. The relationship between empathy and metallization is easy to understand in that you have to be able to imagine what another person is thinking and feeling in order to empathize with him. Self control, on the other hand, takes more explanation. As the child develops the capacity to reflect on what is going on inside of himself, he begins to be able to make sense of the motivations for his actions and also for the consequences of his actions on others. He sees a playmate cry when he pushes him or when he grabs a toy away from her. With the help of an adult caregiver, he realizes that his action caused distress to the other child. Then he starts to make a connection between his inner desire to have the toy or his anger at the other child and his action of pushing or grabbing. He also realizes that if he wants to play with the other child, he will have to control his impulse to push or to grab. All of this cognitive and emotional activity is scaffolded by the caregiving relationship and grows into a competency for self reflection and also for self control. Fonagy and his group call this competency metallization. All individuals, including adults, lose their capacity for mentalizing when they are highly stressed. The individual’s ability to mentalize therefore depends both on the robustness and flexibility of their developmental competency and also on the stress in their lives. We all depend on one another to know ourselves. A working definition of mentalization is that of a form of imaginative mental activity, perceiving and interpreting human behavior. Mentalizing is the capacity to see ourselves from the outside and to see others from the inside. It has to do with seeing oneself as an agent, as an intentional being and also seeing others as intentional beings. The capacity to mentalize allows us to create a narrative continuity over time. Mentalization is an integrative framework. The Development of Mentalization: The newborn has a social brain. She detects and prefers social agents, gazing longer at faces with open eyes and to direct versus averted gaze, showing greater activation of the anterior temporal cortex to voices versus non-voices, and differential activation of the orbitofrontal cortex and insula to happy versus sad voices. The newborn is prepared for mimicry by the mirror neuron systems in the prefrontal and parietal regions, and oxytocin and vasopressin mediate mutuality in the infant-caregiver relationship. In fact, administering oxytocin in the nose makes adults better at reading the expression of others’ intentions. The Reward Circuits Are More Active in Secure Mothers: The oxytocin levels of mothers whose AAI’s (Adult Attachment Inventory) were read as secure before the birth of their child, went up when they interacted with their children. By contrast, in the case of mothers with “insecure” AAI’s, the oxytocin levels went down. Later on, the pituitary, the part of the brain that generates oxytocin, released more oxytocin in secure mothers. Also, the mesocorticolimbic areas were more active for secure mothers when looking at their babies smiling. All this suggests that the reward circuits are more active in secure moms. Fonagy suggests that this is because when the baby is crying, secure moms have an elevation of activity in the Ventral Striatum, whereas insecure moms do not. Rather, insecure moms have activation in insula (negative memories). Looking at their baby when he is sad makes her sad. You could argue that the absence of oxytocin in insecure moms gives them difficulty mirroring their awareness that it is the baby’s sadness and not theirs. That would make it harder for the baby to manage his sad affect. Provisional Model for the Developmental Roots of Mentalization : The “secure” mother generates increased oxytocin when interacting with her baby, in association with a more mentalizing (marked-contingent) maternal response to the baby’s distress. The baby perceives the mother’s empathy, while at the same time appreciating that she herself is OK and available to comfort him. This improves the baby’s regulatory state. The evolving capacity of the baby to perceive his mother as having a different mental state from his own is consistent with the development of mentalization and the infant’s resilience. On the other hand, if the mother herself is insecure and generates a reduced level of oxytocin, she makes a “non-mentalizing response” to her infant, reacting not only with her own distress but with an escalating distress response that communicates helplessness. This is not comforting to the infant and may increase his sense of helplessness and fear. He is at risk of not developing the capacity to discriminate between what is in his mind and what is in his partner’s mind, which makes him more vulnerable. Fonagy referred to a paper in which the maternal oxytocin response predicts mother-infant gaze: in the case of the antenatally secure mother with high oxytocin, the mother looks longer at her infant, especially in the recovery phase of the still face experiment, and there is more imitation of the infant’s intention (Kim, Fonay & Strathearn in press). This is interpreted as the mother’s capacity to tolerate the infant’s distress and is therefore emotionally available to the infant. Numerous studies reveal the development of an important group of social capacities related to reciprocity, the sharing of mental states, self-awareness, and identification. Joint attention is usually achieved at 9-12 mos. This capacity involves the medial prefrontal cortex and posterior temporal sulcus and is incredibly important. In order for humans to have culture, a shared sense of where they are, they have to develop the idea that when they are looking at the same thing as others in their culture, they are thinking the same thing. Studies suggest early emergence of the capacities for empathy and mentalizing. In the Baby and Smurf test, the baby’s capacity to put himself in the place of the smurf who has lost its ball is tested. The baby’s sensitivity to the smurf’s situation (the baby saw where the ball went but the smurf did not) is measured in terms of looking time. The baby at 7 months is capable of considering what the smurf believes about the status of the ball (AM Kovacs et al, Science 2011; 330:1830-1834). At 9 months, babies have a sense of fairness, as they demonstrate in an experiment in which of two giraffes one giraffe gets two toys and the other gets only one. Interestingly, it is relative deprivation, not absolute deprivation that predicts outcome. How well we are doing in relation to others around us has a profound influence on outcome. The Romanian orphanage (orphanages in which the children were essentially deprived of a responsive caregiving relationship) studies show that the age beyond which the influences of deprivation cannot be repaired is between 6-18 mos. Children who were placed in these orphanages at birth and stayed for longer than 6-18 months demonstrated atypical development: signs of autism – reduced imitation, lessened response to name, lower social interest and social smiling, atypical eye contact. On the other hand, deprivation before 6 months (in cases in which the child was placed in a family at 6 months) has surprisingly little consequences. This entry was posted in Articles and tagged AAI, autism, development, empathy, Fonagy, mentalization, mirror neurons, Romanian orphanage studies, secure and insecure attachment on March 14, 2015 by Alexandra Harrison. First of all, I want to give credit in this blog posting to one of my colleagues on this trip, Alayne Stieglitz. Alayne has a background in education of young children and was an astute observer, helping us recognize patterns we might not have seen without her help. 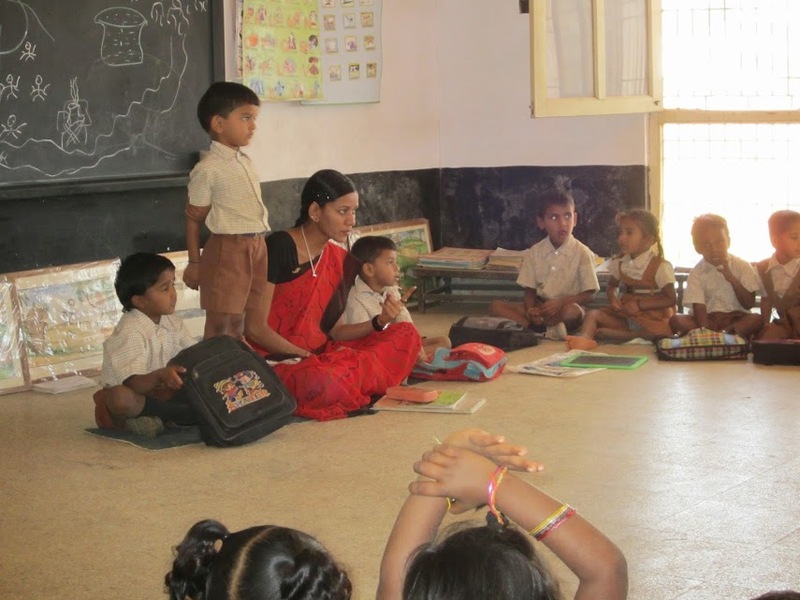 We observed a pre-K classroom of 3 ½-year olds in South India. There were 30 children and one teacher. The teacher was completely in control of the class. Substituting for another teacher who was out that day, she was not new to the school; ordinarily, she taught a third standard class. Although this teacher was not their regular teacher, the students seemed familiar with her cues, which seemed to be “the way they do things” in that school.In a classroom, subtle cues especially, are usually explained verbally and then practiced multiple times until the children recognize them and can use them to get organized. We imagined that was what we were seeing here. In a parent-child relationship that process begins in infancy, and it is likely that most of the cues have originated in nonverbal communications that later gain verbal meaning. The children started the day outside, with free play. Inside, older children from other classes helped set up classroom. Inside the classroom, the children sat on individual mats in a semicircle facing the board, with their backpacks arranged neatly in front of them and began the class with a meditation. Then they were ready to begin. The teacher used a number of different ways to help the children make transitions: (1) First, she asked them to line up to come inside. That activity is spatially organizing and potentially rhythmic; as all the children file in together, it is likely that they will coordinate their pace. (2) She asked them all to sit on their mat in a cross-legged position and place their backpack in front of them; that also organized the children in space and included repetition on a theme – sit in the right position in the right place and orient another identifying part of you – your backpack – in front of you. (3) Then there was the meditation; meditation is highly organizing, calming the body and emotions and lowering stress. The multiple steps involved in settling down to begin the lesson would be expected to facilitate the transition by establishing a 1, 2, 3 4 rhythm – first (1) get in a line to come inside; then, (2) get out mat, and (3) place your backpack on floor in front of the mat; then (4) sit down in the right position. Sometimes, when a child was not in place on his mat on the floor, she would reposition his backpack, which seemed to be a cue for him to take his place. (5) The teacher also used counting to go from one activity to the next. This entry was posted in Articles on March 1, 2015 by Alexandra Harrison.